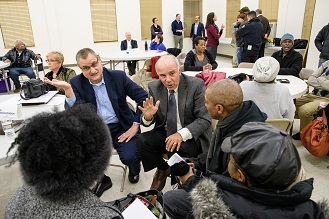 JERSEY CITY, N.J., Feb. 8, 2018 – More than 20 residents and interested parties attended a public open house conducted by the Chromium Cleanup Partnership last Tuesday evening. 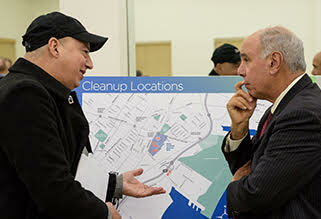 Site Administrator Ron Riccio and a variety of experts met with guests and answered questions on a variety of topics, ranging from PPG’s chromium cleanups to redevelopment of the Garfield Avenue sites when restoration is complete. Conducted at the Mary McLeod Bethune Life Center, the open house included representatives from the New Jersey Department of Environmental Protection, the Jersey City Redevelopment Agency, PPG and the site administrator’s office. Earlier in the day Riccio submitted his twice-a-year progress report on PPG’s chromium cleanups to New Jersey Superior Court Judge Barry P. Sarkisian. The 28-page document includes an update on the status at each of the remaining locations requiring cleanup in connection with a 2009 judicial consent order with NJDEP and the City of Jersey City. JERSEY CITY, N.J., Jan. 30, 2018 – Site Administrator Ron Riccio submitted his twice-a-year progress report on PPG’s chromium cleanups to New Jersey Superior Court Judge Barry P. Sarkisian today. The 28-page document includes an update on the status at each of the remaining locations requiring cleanup in connection with a 2009 judicial consent order with the New Jersey Department of Environmental Protection and the City of Jersey City. Site Administrator Ron Riccio, right, listens to comment about PPG’s chromium cleanups. JERSEY CITY, N.J., Jan. 4, 2018 – Ron Riccio, the site administrator for PPG’s chromium cleanups, and a variety of experts will be available to meet one-on-one with residents and interested parties during a public open house Jan. 30 from 6:30 to 8:30 p.m., at the Mary McLeod Bethune Life Center, 140 Dr. Martin Luther King Jr. Drive. The event will begin with opening comments from Riccio, who will review the progress being made at PPG’s cleanup sites. Attendees can then visit with members of the technical teams at a series of information tables to ask questions.